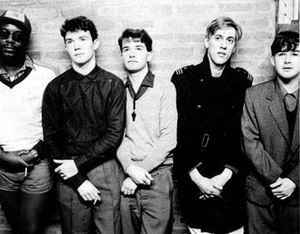 British post-punk band formed in 1977 in Wythenshawe, Manchester. A Certain Ratio took their name from the lyrics of Brian Eno's song "The True Wheel", taken from his album "Taking Tiger Mountain (By Strategy)" (1974). A Certain Ratio originates from the Independentlabels "Factory Records" (known by Joy Division, New Order, etc.). On their first releases they sound like a successor band of Joy Division. After a trip to New York in the year of 1980, they quickly developed towards funk. The album "To Each" (1981) is characterised by African percussion, funky drums and bass as well as a sepulchral mood in the style of the Joy Division. After the release of the album "Sextet", which continued the sound of the successful album, singer Simon Topping left the band. He turned to an uncompromising jazz funk sound. Over the years the band approached the catchy Popsound with funk elements. A Certain Ratio Guess Who? ACR really needs the comprehensive box set treatment IMO. Does the band own the rights to their music (Factory, Robs Records)? Which reissue/specialty label would be a good fit for such a rich recording history?
. . . . . A poor mans Joy Division?